It is always interesting to see how independent teams come up with different solutions to the same problem. Particularly when they make different design decisions, and those alternative decisions can both be strongly justified. The early years of the space race demonstrate a fine example in the design of the reentry vehicles. Soviet Vostok designers settled on a perfect sphere with inherent dynamic stability. No attitude control. It needed an all-round heatshield to protect it on reentry. A low centre of gravity and the laws of physics ensured that the sphere was in the correct orientation when the door was blown off and the cosmonaut ejected at 7,000m. 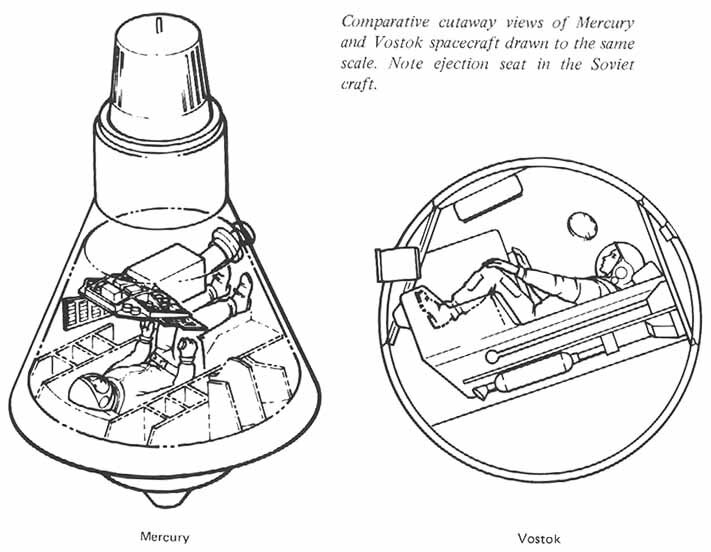 The American Mercury designers went for a blunt body design, which allowed them to place the bulk of the heatshield at one end of the craft, saving weight over the all-round heatshield approach of the Vostok. This required attitude control to ensure that the heatshield was facing the right way when plummeting through the atmosphere. For both designs, simplicity was a key factor.